I’m not going to revive the endless debate about whether or not Riedel’s brilliant marketing of individual wine glasses for every type of grape and wine is just a scam, or has some validity. But when a new Riedel design is released, I enjoy testing it out. In fact, when any new wine glass design is circulated, by anyone, I am intrigued. Most of them don’t work for me. But occasionally, a really terrific design comes along, and that becomes my stemware of choice, not just for a single type of wine, but for a whole range of wines. That is what has happened with the Riedel Malbec glass. Argentine’s Graffigna winery and Riedel have introduced a new design purportedly developed to accurately display the quality and flavors inherent in Malbec wines. It was officially introduced on Malbec World Day (who knew?) on April 17. 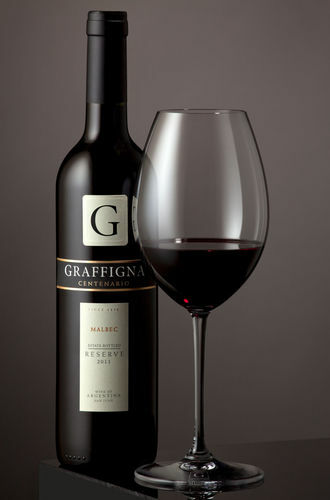 A sample of the stemware arrived with a bottle of Graffigna (big, jammy and quite tasty) and I’ve been trying it out. 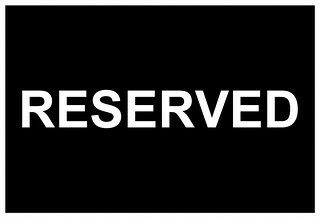 when is a reserve not a reserve? Some years ago I happened to receive samples of two unrelated, inexpensive California wine brands. They were just the sort of wines that line the supermarket wine shelves, and with admittedly low expectations, I set about tasting and comparing them. During the 11 years that I wrote a weekly newspaper column, the most difficult challenge was not finding interesting wines to recommend, but rather to find interesting and cheap wines to recommend. Most newspaper readers are not looking for something rare and expensive. They want something they can find at the supermarket for under $10 and drink with dinner. Fair enough. But it isn’t all that easy to recommend most of the wines that meet those basic requirements. Quite honestly, the vast majority are drinkable, often over-manipulated, plonk. So when a brand showed up that offered both quality and quantity at an every day price, I did a little Snoopy dance and happily endorsed it. I’ve been writing about wine for more than 25 years, studying it for much longer. The realities of my profession, tattered and under fire though it may be, are that I am immersed at all times in a fertile, non-stop series of events, tastings, conversations and close encounters that all contribute to my wine education. And yet, there is always more to learn. When I embarked upon the adventure of actual wine making, it was principally because it was yet another opportunity to learn. It was a chance to draw my own pictures with someone else’s really big crayon box. 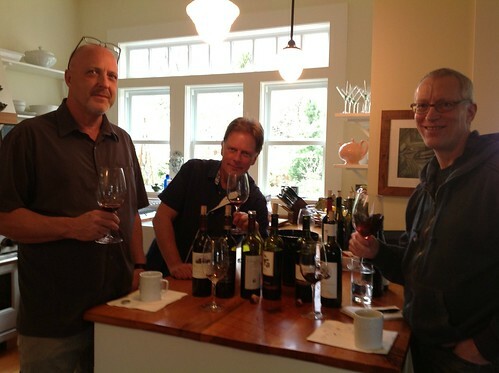 To see if I could make – with great professional assistance – some of the wines I’d dreamed up or hoped that someone else would make so I could taste them. William Church was one of the earlier arrivals into the Woodinville warehouse district. Their first vintage was 2005, and I was introduced to the wines by Matt Loso, who was consulting at the time. There was a 2005 Dineen Vineyard Syrah that missed the mark for me, and a Cabernet Sauvignon, also from Dineen vineyard, that seemed to have a lot of new barrel flavor overpowering the fruit. Subsequent vintages were a bit hit or miss, and looking back at my early reviews, I can see where some wineries might have become discouraged, and simply stopped sending the wines. But the wines kept arriving, as the vintages progressed, and steady progress was evident. Marcus Rafanelli joined the winemaking team in 2008, and when I met him shortly after, he was already excited about the wines. Those 2008s included a stylish and balanced Gamache Vineyards Malbec, a 90 point Syrah and a superb, 90 point Bishop’s Blend. Clearly a turnaround was in the works. 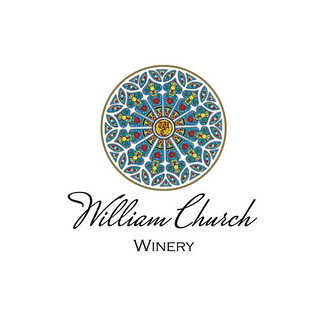 Since 2009 the William Church Viognier has been notable as well. Overall, vineyard sources have been consistent, the winemaking team has several years of experience, and the current releases, taken all together, are the strongest ever. 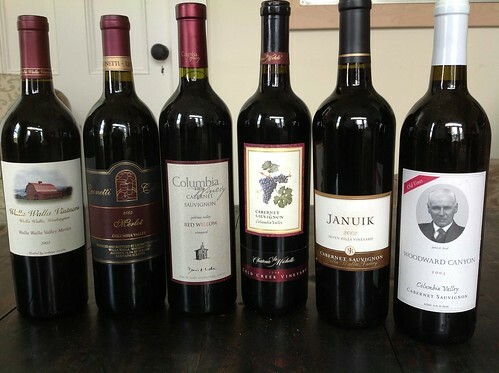 Here’s a preview – full reviews and scores will be published in the Wine Enthusiast. tell me again where in oregon is alsace? In his excellent 1WineDude post on 1WineDude yesterday, blogger Joe Roberts paraphrased some lengthy discussions about what younger (Millennial) wine drinkers want from a wine. I strongly encourage you to read the whole post. But for you slackers – his main points were that the new generation is looking for wines with authenticity, a good story, true (non-fabricated) quality, interest (as in non-boring), a connection to a time, place or person, and wines that generate discussion. None of this is surprising, as Roberts himself acknowledged. But it’s especially useful when this checklist is used as a sort of a screening mechanism for a wine, a brand, or an entire category. Here’s a small example. The two oldest wines poured last weekend at my tasting with Eric Asimov and Kevin Pogue were especially meaningful to me, and I was thrilled at how well they both performed. The Chateau Ste. Michelle 1999 Cold Creek Vineyard Cabernet Sauvignon (14.1%) was sourced from a vineyard that I have long felt was the real diamond among the Chateau’s single vineyard offerings. I would suspect that this Cabernet came from some of the first vines planted there, which would have made them about 25 years old even back in ’99. The 1999 vintage was a cool one in Washington, and upon release many, perhaps most of the Cabernets and other red wines were tannic and hard, with noticeable green flavors. And yet the structure and power were there if you looked. Many in the national press did not understand Washington wines all that well at the time, and this was certainly a Washington vintage, not a ripe and jammy California one. I remember reading more than a few reviews of wines that I very much admired that dismissed the vintage as poor. But I think it has redeemed itself, with wines such as this. “Riding With The King” was the soundtrack running through my head on Saturday during a two hour tasting of older Washington wines with Eric Asimov of the New York Times. Eric was visiting Walla Walla – his first time tour of eastern Washington – as a guest of Whitman College and geologist Kevin Pogue. They had spent the day visiting Red Mountain and Snipes Mountain vineyards, and pulled up in front of my Waitsburg cottage around 5 in the afternoon, looking a bit parched. We soon took care of that! 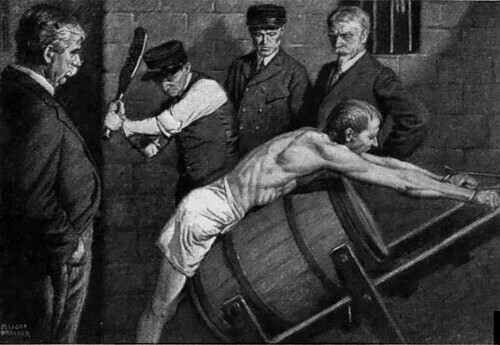 I’d offered to open a selection of well-aged wines from my cellar, and I had a lovely time earlier in the day pulling bottles from the shelves and considering which to show to Eric. One of the principal reasons I keep a large percentage of Washington wines in my rather cramped cellar is exactly for occasions such as this, when a visiting writer or winemaker comes calling. It’s great fun for me also, and there is always a surprise or two lurking among the bottles. Eric and I have met on several occasions, but this was the first time he’d been out to eastern Washington, and certainly Waitsburg had not previously been on his radar. The opportunity to taste with him at my home in a most relaxed and unhurried way was truly special. We all owe Kevin Pogue a debt of gratitude for his work putting the trip together, and giving Eric a fine look at Washington terroir. This weekend’s column will be my last for the Seattle Times. It has been 11 years since I became the Wine Adviser for the paper, and in that time I have written something like 500 columns. The path that led me there was a curious one. The late Tom Stockley, who had written the wine column for decades, was a friend and mentor. His sudden and tragic death early in 2000 was a blow not only to those who knew him, but to the entire wine community. Suddenly, there was no leading, authoritative voice tracking the ongoing development of the second largest wine producing region in the country. This spring I’ll check in with the rush of new rosés as they are released; no need to wait for newspaper publication deadlines. I’ve tasted a dozen or so in recent weeks and as usual, they come in all colors and a variety of blends, though it’s more and more difficult to find any that are not bone dry. Not that that’s a bad thing! 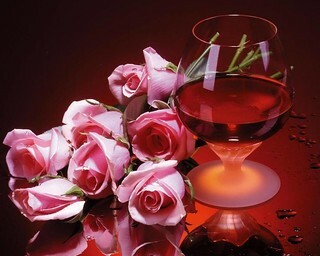 What I look for in any rosé is more than a pretty face. 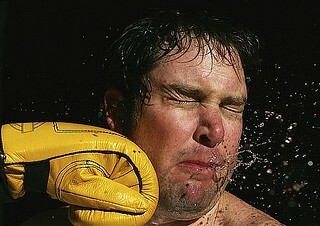 I want a rosé that is as expressive as any other good young wine, something with texture and lift, density and detail. I love the range of flavors that the different grapes and blends can show. Opening any unknown, untasted bottle is a guaranteed surprise. But as with most wines, the real superstars are the exception, not the rule. 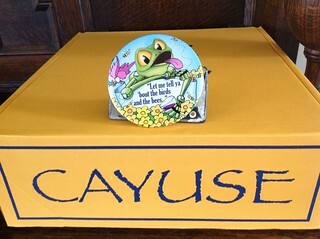 It is a measure of the respect that Cayuse wines command that the first weekend in April – the only weekend in the year that Cayuse is open, and only then to mailing list members – is more or less referred to by one and all as Cayuse Weekend. It is the unofficial opening of wine touring in the Walla Walla valley, and many other wineries and tasting rooms roll out the red carpet to welcome visitors. This year the weather was cool and blustery, but perfectly suitable for tasting young red wines, which is what was going down at The Box, as vigneron Christophe Baron calls his no-frills winery. There were eight wines being shown, three from 2010 and five from 2011. Both were cool and difficult vintages in different ways, and production at Cayuse was significantly down, as all the wines are entirely estate-grown. No Edith Rosé this year, no Flying Pig, no Camaspelo and no Impulsivo Tempranillo. What was on display was a breathtakingly elegant lineup of classy Syrahs, along with the much-loved God Only Knows Grenache, the excellent Widowmaker Cabernet, and a new blend called The Lovers. I’ve recently done some media consulting work with clients wanting help developing their story. 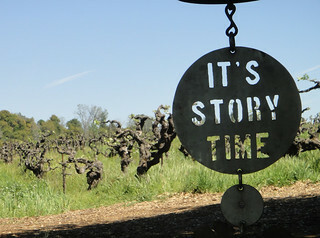 A good story is undoubtedly an asset, in any enterprise, but certainly when selling a product such as wine. Those relatively rare winemakers with a real gift for storytelling attain a fair amount of celebrity, and assuming that their wines are well-made and priced fairly, they do well competitively. But not everyone has that Barnum & Bailey flair, and so the need to tell a compelling story somewhere, somehow, becomes even more urgent. What makes for a good story? John Mariani, whom I have never met, is a well-respected wine writer of long standing. He has what seems to me to be a distinctly east coast palate. No criticism intended there – it’s just an observation. This was brought into blunt focus by a piece that Mr. Mariani posted on the Bloomberg website with the headline “Washington Wines Pack High Alcohol Wallop, Little Else.” Ouch! I read his remarks with great interest, because I too have found some Washington wines, in some vintages, to be rather overblown, and I have written critical reviews regarding excessive alcohol levels on more than a few occasions. However, it seems more than a little broad-brushed to dismiss the entire output of the state with such a bombastic headline, and as I read through the article, there were a number of indications that this was a pretty quick and generic look at what is really going on here. 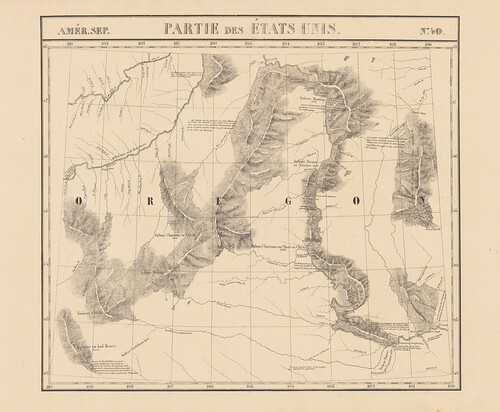 Terroir is often claimed, but rarely captured. It is easiest to spot by tasting multiple wines from a single vineyard. Boushey and Ciel du Cheval come to mind – each expresses itself consistently no matter who is doing the winemaking. Less common is finding a clear expression of a place from a vigneron – a winemaker who uses his or her own estate vineyards exclusively. In Washington, the vast majority of winemakers source grapes from far and wide, rather than focusing on estate-grown fruit. There are exceptions – Christophe Baron at Cayuse, Chris Figgins and Leonetti and FIGGINS, Serge Laville at Spring Valley – who do capture specificity in a bottle. But the most difficult challenge is to make wines that typify a place that is far away from the actual winery. 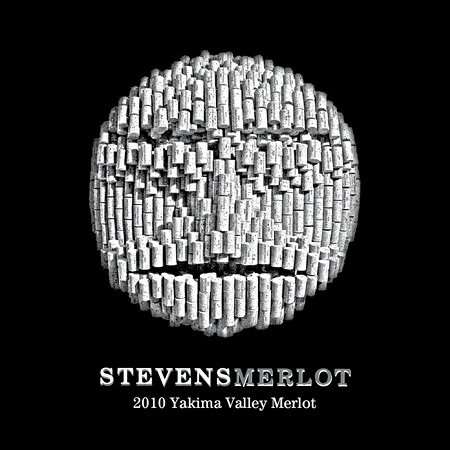 Which is one of the great strengths of Tim and Paige Stevens at Woodinville’s Stevens winery.